The Sobranie Cigarettes brands are produced in various places in Europe by the Gallaher Group. Sobranie of London was established in 1879, the original cigarettes were handmade in Russian tradition, and are still produced at Old Bond Street in London. 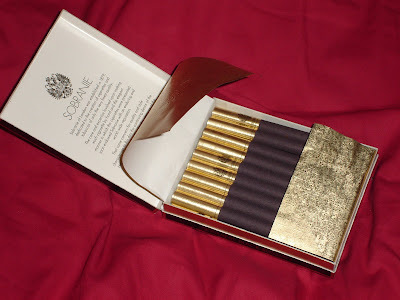 Premium varieties include the evening-out styles Sobranie Cocktail and Sobranie Black Russian, which are produced in Ukraine and as of 2005 in Russia itself. Sobranie Cigarettes produces several styles geared specifically for ladies, some slimmer than standard cigarettes and others brightly colored. Cocktails are five separate pastel shades with a gold foil filter, and are the same ring gauge as standard cigarettes, unlike Nat Sherman's Fantasias, which are slimmer and use deeper, primary colors. Black Russians are black with a gold foil filter. Both Cocktail and Black Russian variants are emblazoned with the Russian imperial eagle and using blends suited to Russian tastes. Different blend than Cocktails. Sobranie is one of the most expensive cigarette brands in Russia, and is considered to be a brand comparable to Dunhill cigarettes.